Reports from West Papua claim Indonesian anti-terrorist police have torched a remote village amid clashes with guerrilla rebels in the region. Activists say civilians have fled into the jungle in response to the unrest and there are now grave fears for their safety. 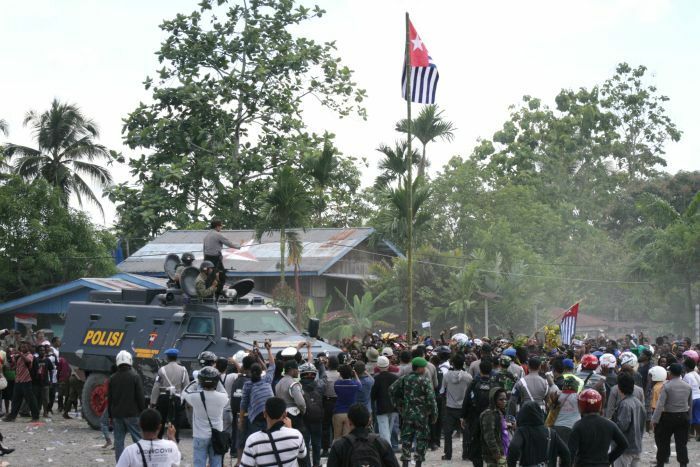 Media is strictly controlled in the region, making reports hard to verify, but it is claimed that Indonesia’s Gegana Brimob police unit attacked the village of Wandenggoback, in the Papuan highlands, in response to the shooting deaths of two police officers on December 3. The two Indonesian police were reportedly killed earlier in the day during an offensive launched by the militant Free Papua Movement (OPM) and the anti-terrorist brigade responded by setting fire to schools, a church and houses in the village. Reverend Benny Giay from the Papuan Christian Church in the province’s capital, Jayapura, says he has spoken to school teachers and young people who are among those who fled Wandenggoback. “The police mobile brigade burned the church, schools and houses of the people and people have fled to the bush. They’ve become local refugees,” he said. He says there are concerns for the safety of the villagers who have fled and are now hiding out in the rugged highlands. “Some have run to a neighbouring district. Some we think they are in the bush and we are worried that they may get sick and even die out of starvation,” he said. “What we are worrying about is that [the Brimob] have been doing this, they’ve been terrorising people, people are fleeing the villages and people are dying in the bush out of sickness. Mr Giay says Indonesian authorities have blamed OPM guerrillas for the death of the two police officers, but he says that claim needs to be investigated. “We are saying as a church to make sure, if the government allows human rights NGOs to go there and do an investigation so we can find out who made the shootings which killed two policemen,” he said. On December 1 West Papuans marked 50 years since the province declared independence from Indonesia. Rallies were held in many areas and the province’s banned morning star flag was raised. Nick Chesterfield, editor of West Papua Media, says they are getting reports from villages around Wandenggoback of a security crackdown in response to the independence ceremonies. “The reports that we’re getting at the moment are that Indonesian security forces have been rampaging in areas near Nulia and that people are fleeing to the hills in the area,” he said. “The district of Pagalome is now quote ’empty of humans as all have fled’. People have no ability to grow food up in the mountains; they have fled with whatever they can carry, so there are grave fears. Mr Chesterfield says as many as several thousand civilians could now be hiding out in the jungle. “There have been instances in the past where up to 10,000 people have hidden out in the mountains for up to three months,” he said. But he says there is little food and shelter for those who have fled. “There’s not much cover in the highlands. Where people will be fleeing is to the mountain peaks,” he said. Indonesia’s anti-terrorist police receive training and funding from the Australian Government. The Department of Foreign Affairs and Trade says it seeking to verify the reports from Wandenggobak. “The Australian Government deplores violence in all its forms. The Australian Embassy in Jakarta follows closely developments in Indonesia’s Papua provinces and is seeking to verify reports of incidents around Wandenggobak in the Papuan highlands,” the Department said in a statement. “Australia continues to urge Indonesia to investigate thoroughly any allegations of human rights abuses and to hold perpetrators to account and welcomes president Yudhoyono’s commitment on November 19 to take legal action against any security forces personnel who commit human rights abuses. West Papua has seen several instances of unrest in the past few months, with Indonesian military and police blamed for killing three activists in August and arresting hundreds more. Shots were fired and a number of West Papuans were also arrested during independence ceremonies on December 1. 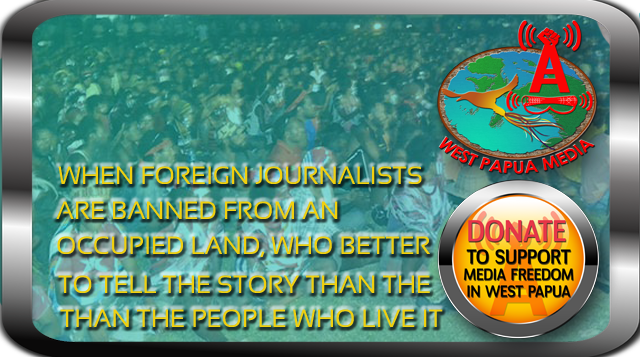 Let the People of Papua choose their own will….They have the rights to live too!!! !